Mr. Snarky and I both took a half day today, to attend the Halloween parades at our daughters' schools. We realized last year that with two parades and extra rough traffic as everyone tries to make it home for the trick-or-treating, it was silly to try to fit in a full day of work. This year, Petunia's parade was up first, at 11:30. Back when we were choosing costumes, she told us she wanted to be a witch, and stuck with that for the requisite several days before we purchased a witch's costume for her. 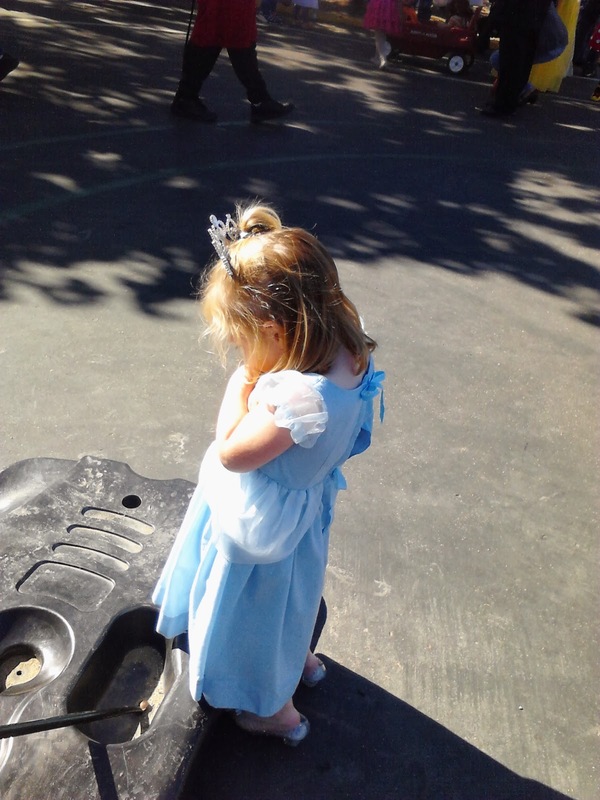 Parents who have ever had a four year old can guess what happened next: she insisted on wearing her Cinderella dress and shoes for the Halloween parade. She went out trick-or-treating as a witch, though, and we already had the Cinderella gear, so I'm calling this a win. She was adorable, and so were all her friends. There is a little toddler- walking, but not yet 18 months old- who is for some reason a favorite of Petunia's. He likes Petunia, too, and apparently points and says her name when he first sees her in the morning. The teacher brings him out of the baby yard most days to give her a hug goodbye when I pick her up. He was dressed as the cutest tomato imaginable and Petunia chased him across the play yard to extract a hug. He was more interested in getting a chance to explore all the toys on the big kids' side of the fence, but she did eventually get a hug, so all was well. Petunia then decided to turn camera shy, so we could not get a picture of her and her beloved tomato or of her with any of her friends or teachers. However, this fit of camera shyness did have the benefit of providing me with a photo for this blog post. Mr. Snarky and I had a nice leisurely lunch before heading to Pumpkin's parade. She is in a K-8 Spanish immersion magnet school. After the first grade, kids can only transfer in to the school if they can pass a Spanish test, so the number of kids decreases as you go up in grade level- kids move out, for whatever reason, and almost no one transfers in. One of the nice side effects of this is that the upper grades seem quite close knit and have a lot of spirit. They participate with a fair amount of enthusiasm in things like Halloween parades and other festivals and assemblies. The Halloween parade is cool to watch. The big kids- from about 5th grade up- reach out to high five the little kids both as the little kids go past in the parade and then when the big kids are parading and the little kids are sitting. The little kids LOVE this. So do I.
Interestingly, the big kids tend to wear quite appropriate and non-scary costumes. However, there seems to be an age at about 3rd or 4th grade when the boys in particular favor scary masks. Today, as I was standing behind Pumpkin's class watching the parade go by, I noticed that one of her classmates was trying to get out of his seat. He broke free but got stopped by one of the parents there to help with the parade, who told him he had to stay with his class. It turns out that he was frightened by the masks. The parent helper eventually convinced him to sit down behind the row of parents, so he couldn't really see the masks anymore, but he was still upset. In the end, I held his hand for most of the parade, and that seemed to help. He sort of knows me, because he takes swim lessons at the same school Pumpkin does, and we've run into him there a couple of times. But I think he would have held any adult's hand. As I stood there, holding the hand of a six year old boy so sensitive that he could not bear to watch a parade in which some of the older kids were wearing scary masks, I was struck by how unfair life is going to be to him. He has clearly already learned that boys hold in their emotions, because although he was visibly distressed, not a single tear fell. But worse than that, in 15 years, the man that this sweet little boy grows into will almost certainly scare people just by walking down the street, because he is Black. That man will carry the sensitive boy frightened by masks inside him, just as I carry the sensitive girl upset by TV depictions of someone making a fool of themselves inside of me. But too many people will not see that, and will see only his skin. If he is lucky, the worst that will happen is that they will cross the street rather than walk near him. I stood there, holding his hand, wishing I could make the world a better place for him, but knowing I cannot. I could not even really make the Halloween parade less scary for him, so what can I hope to do about the truly scary things out there in the world? Then the parade ended. I helped him get his chair back in line with the rest of the class, and we all walked back to the lunch tables for a Halloween party. I hugged Pumpkin and took her picture, helped hand out juice pouches, and made small talk with the other parents there. We all cleaned up, the bell rang, and Pumpkin and I walked home. Mr. Sandwich and I intentionally take photos that we refer to as "bloggable," because they don't show Baguette's face. We had our own costume switcheroo this year, although fortunately with fewer tears than last year.